Mansoor Khan talks about the economic distress that has been persistently plaguing the world since the 2008 global economic crash in his book The Third Curve: The End of Growth as We Know It. He introduces us to a new field of study that is termed ‘Energetics’, which takes into account the vital role of energy in the dynamics of the financial world. An alumnus of IIT Mumbai, Cornell University NY and MIT Boston, this computer science engineer is the son of filmmaker Nasir Hussain, infinitely well-known for catapulting his cousin, actor Aamir Khan, into the echelons of Bollywood fame. After directing blockbusters such as Qayamat Se Qayamat Tak and Jo Jeeta Wohi Sikandar, Mansoor escaped the pressures of Bollywood and city life to find refuge in Coonoor in 2003. Here he manages a self-supporting organic farm, Wild Acres, which functions as a cheese making homestay as well. He continues to give talks related to his book all over India. It has been a unique transition from computer science to film direction to authoring a book on economics. It is a journey that provides vital information to awaken complacent folks from the comfort of the illusion of perpetual economic growth; a concept that is inconceivable on the premises of energy and not currency being the driving force of economies the world over, and the inevitability of the depletion of that energy without regenerative sources. Mansoor puts forth his explanation, dividing it into three phases. The first phase is called Paradise Times (1750-1960), when growth began and we saw surplus food, telecommunication, air travel, cars, computers, mega cities, electronics, etc. During this time, the idea of perpetual growth took root. The second phase, which started somewhere in the late 1960s to the beginning of the 70s, was the emergence of the end of a period of veritable bliss. Post 1970, animals like the whale, panda, etc, had their numbers dwindling, with many species gradually becoming extinct. Water table levels began falling, there was an increase in wars, food prices rose, climatic changes began taking place and so on. ‘It seemed as if life itself was withering. After Paradise Times, we found that life itself was withering. And life is the most important thing to us. So we dubbed it ecological collapse,’ says Mansoor. We were, however, quite certain that the process could be reversed with the financial power in hand by leaving the job to NGOs and so forth after giving them the money. The economic downturn post 2008 brought that idea down with a resounding crash. There was debt crisis, inflation, volatile markets, and industrial growth had decreased. Essentially, money had begun to wither. The connection between the positive aspects of Paradise Times and the negative effects seen in the next two phases is ‘growth’. Mansoor says, ‘Growth is the largest religion ever. It beats Christianity hollow, it beats Islam hollow, it beats Hinduism…it beats all of them combined hollow. We vote for our government based on that, we design our policies, our college courses, we think and plan based on that.’ Bear in mind that this growth is quantitative and not qualitative. Is perpetual growth possible, and if so, is it desirable? We would all admit it is desirable, which takes us back to the first question of whether it is possible. The mind produces concepts but it is the body that needs to play that concept out as reality. Without doubt, the body has its limitations on what it can carry out no matter how fantastic the concept the mind can conjure up. For example, if a coach (mind) wants a runner (body) to break the sound barrier, he may tell the runner to increase his speed gradually at a sustainable pace. This would produce sustained progress as in Paradise Times and this growth is true. As soon as the coach begins to imagine that if the speed is increased by twofold every week this will produce better and faster results towards breaking the sound barrier things begin to go downhill. The runner finds it difficult but continues despite the stress on his body by taking vitamin supplements and whatever else that can keep him going. While the desired speed, mentally conceived, grows exponentially, the actual speed progresses only slightly. The runner reaches his peak and the body collapses: this is phase two. The growth here is false. The third phase is the collapse of the concept where growth then edges towards its demise. All of us expect money to grow exponentially forever, but we fail to realise that money growth needs to be supported by the use of resources. Since 1850 we have been able to maintain an exponential increase in money along with the increase in the consumption of resources. The discovery of coal in 1750 led to the Industrial Revolution and growth thereafter seemed to have no limit. ‘Oil runs the world today,’ says Mansoor, propounding the discipline of energetics that states that the world functions on the basis of energy, which is reality and not a concept. Money, on the other hand, is steeped in concept. The Earth, with its finite resources, can be seen as the body of the runner and money is the coach who decides what the runner does. All resources follow the laws of geology: they reach a peak and then veer into the descent mode, forming a bell curve as seen in the example of the coach and the runner. M King Hubbert looked after the infrastructure of Shell Oil and, in 1954, he was mocked for his prediction that oil resources would peak in the US in the year 1970. He also found that forty years after the discovery peak for a resource, the production of that resource would peak too. The bell curve was the same pattern followed by every oil well irrespective of its size. In time, Hubbert was proved right and this was the reason for the shift to oil wells in Saudi Arabia. He said global oil discovery had peaked in 1960 and therefore in about 2000 oil production would peak. The peak was in 2005, however, because in 1980 there was a dip in oil production orchestrated by OPEC (Organisation of the Petroleum Exporting Countries) as there was an attempt to control oil prices. Our dependence on fossil fuels is evident in transport, industry, agriculture and electricity functioning because of it. Seventy eight percent of oil goes into running the world and twenty two percent is used in building the world (bitumen, plastics, fertilisers, lubricants, etc.) In 150 years we have been able to finish half the oil reserves that took 300 million years for the sun to create. We must remember that this oil is non-renewable. We expect continual growth of m oney but energy, which runs the world in reality, begins to decrease. We sought to maintain the conceptual money growth at an exponential level through artificial means by introducing new concepts. As each new concept arrived at a ceiling a new one was brought in. There was the institutionalisation of the stock market, banks began lending more money and holding less, currency was printed with no gold standard to validate it, and leveraging was begun (banks loaning larger sums of money against smaller deposits). All this was done to keep the money curve growing, but risk was growing too. If a person could not pay back the loan then the banks offered them options to pay a penalty and this was determined by the Black-Scholes Model for options pricing. Ironically, the Nobel Prize winning economists lost 4.6 billion dollars when they applied their own model in their company Long-Term Capital Management and had to be bailed out by the US government, which indicates how far removed this pursuit of money growth is from reality. The Glass-Steagall Act, which prohibited commercial banks from being part of the investment business, was repealed in the US. The banks, using leveraging, options and Black-Scholes derivative, were now able to design complex financial instruments such as the hedge fund, the collateralised debt obligation (CDO), the housing mortgage, the structured investment vehicle (SIV), etc, and predict huge profits. This lethal combination of leveraging, options and Black-Scholes derivative was up against the reality of ‘peak oil’ (global discovery) in 2005 and, in March 2008, the stock market crashed as we entered a period of shrinkage. Now to prevent the collapse of economies we have begun to draw on natural and ecological capital, resulting in environmental degradation; people are investing more time in making money rather than in social relationships; there is loss of values such as integrity, honesty, etc; cultural entities such as ideas, music, folklore, etc, that were once free, are now subject to intellectual property right laws. ‘We cannot make money grow without destroying the environment,’ says Mansoor, as he points out that the exponential growth of global GDP has resulted in exponential species extinction, loss of tropical rainforests, acceleration in water usage and atmospheric carbon dioxide concentration, exploitation of fisheries, ozone depletion and so on. American essayist and author Edward Paul Abbey said, ‘Growth for the sake of growth is the ideology of a cancer cell.’ Therefore, perpetual growth is a global cancer. Perpetual growth is both impossible and undesirable. It is imperative that we face the reality that energy is the world currency and make a choice of energetics over economics. 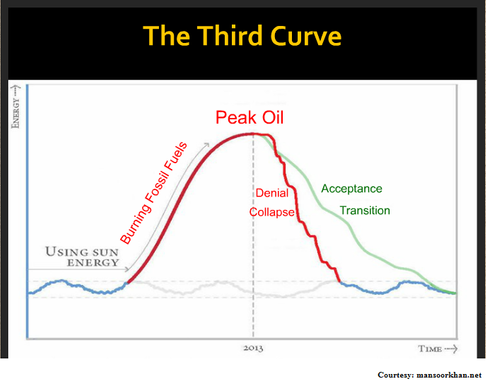 The Third Curve is a reference to the Sun, and the Earth’s sunlight capturing and storing ability. The Sun alternately increases and diminishes in presence in the context of the varying seasons, and this is reflected in the Third Curve: a wavelike growth that stays within a narrow band of value. 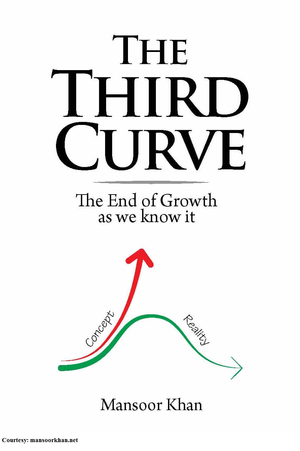 Achieving this Third Curve is the way out of the economic conundrum that has beset the world. *This article is based on a lecture by Mansoor Khan at the Kokum Design Centre, Porvorim, Goa.